Lookout Peak was no different for me. 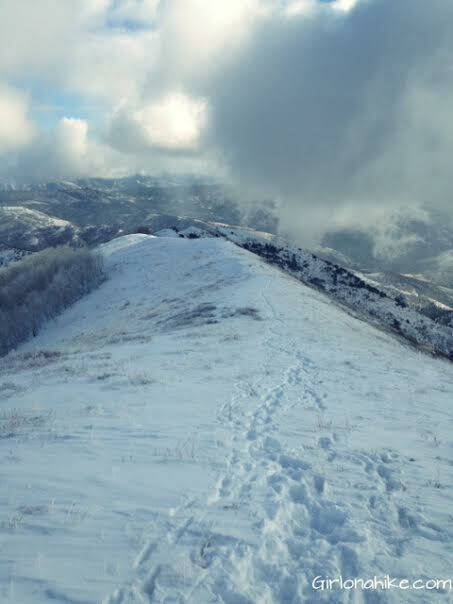 Last weekend when I hiked Little Black Mountain, I saw Lookout Peak from afar, and just had to hike it! I think its safe to say I'm a little obsessed! Lookout Peak sits at an elevation of 8,954 ft up Killyons Canyon in Salt Lake County. 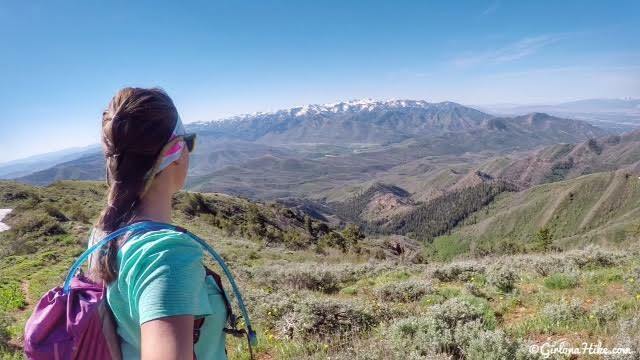 The summit is not the most spectacular, but the ridge on the hike up offers amazing views of Parley's Canyon, Emigration Canyon, and City Creek Canyon. 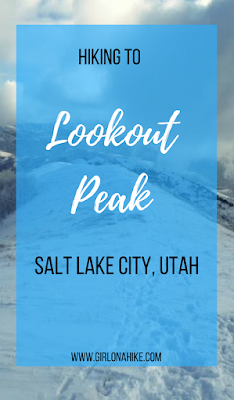 Although it is considerably lower in elevation compared to the more famous peaks of the Wasatch Front, Lookout Peak still rises over 4,000 ft above SLC. 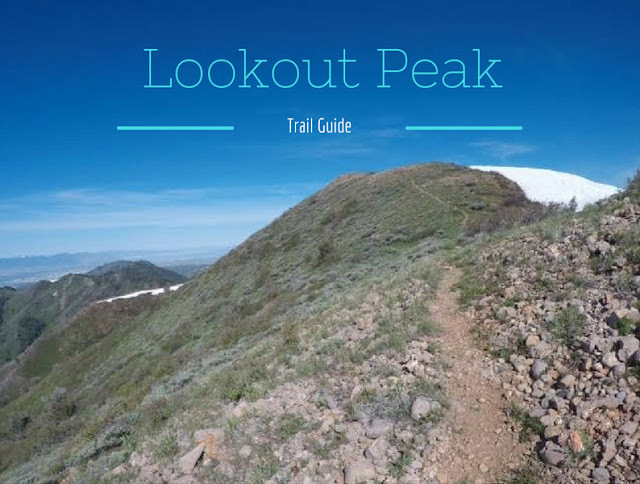 Though there is a well defined trail, Lookout Peak gets much less traffic compared to other peaks. Many people just do not know about it. This peak would not be good to hike in spring or after a big rain/snow, since it gets very muddy. If you are driving from SLC, use this map. Park right before the road splits for Killyons and Pinecrest on the right side of the road. 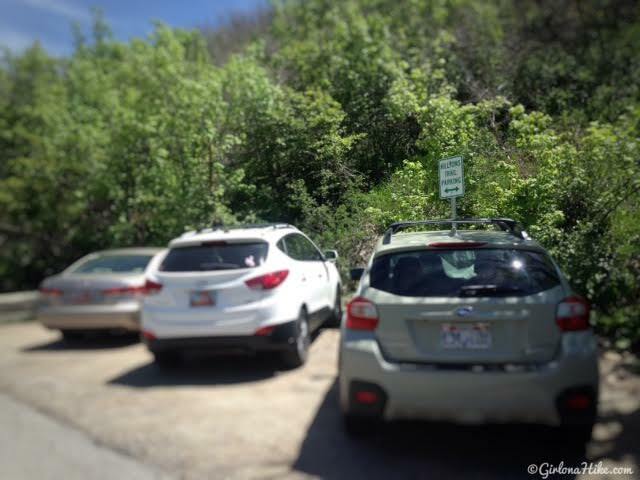 You should see the trail parking sign. You will then need to walk up 1 mile to reach the official TH. As of October 2016 you can no longer park right at the TH nor in Killyons Canyon Rd. You have to park all the way down the road, then walk up about 1 mile to reach the official TH. You should see two areas with the "Killyons Trail" parking sign on your right as you turn onto the road. About 4-5 cars can fit at each pull out. 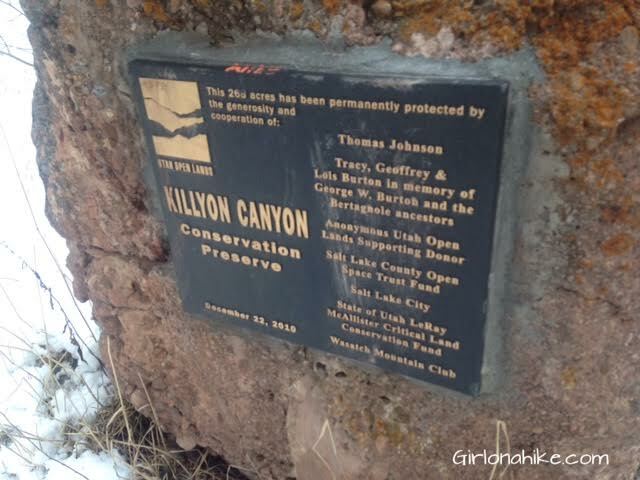 10 minutes into hiking, you'll see the "Killyon Canyon Conservation Preserve" sign. So glad to see this area is protected! 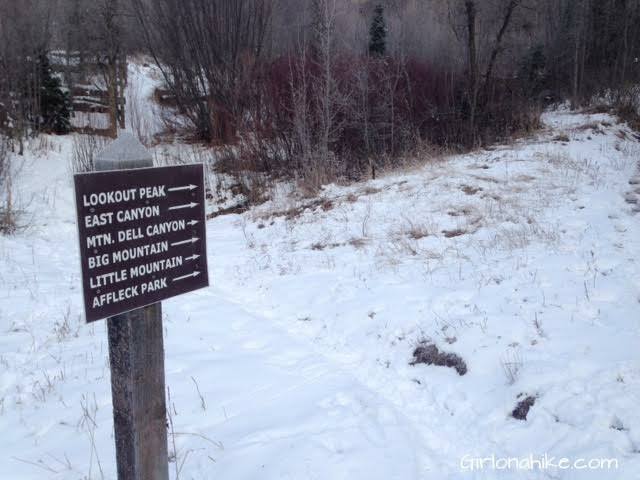 After one small switchback, you will come to a 4-way intersection. Head left (north) from here. If you go straight it will take you to Affleck Park, and right follows the ridge south. 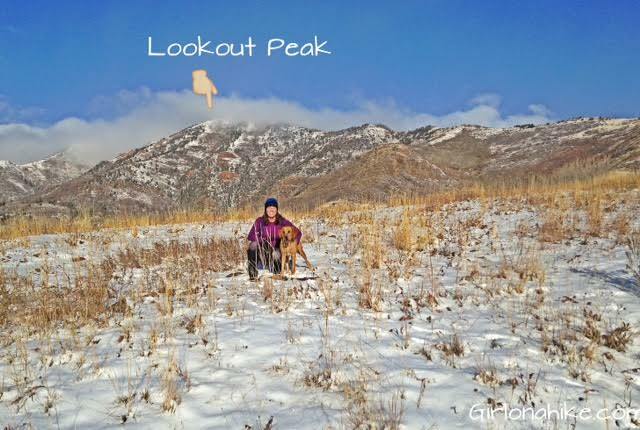 Up on a small saddle, you will finally be able to see Lookout Peak. What a difference one year makes! 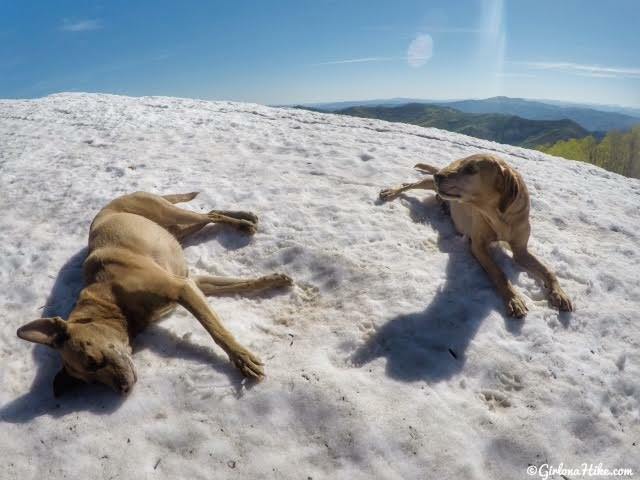 We had SO much more snow in 2017 compared to 2016! This is the exact same spot as above. Working our way up to the ridge. We had amazing views! We hiked here right after a snow storm, and were hiking in 4-5 inches the whole time. 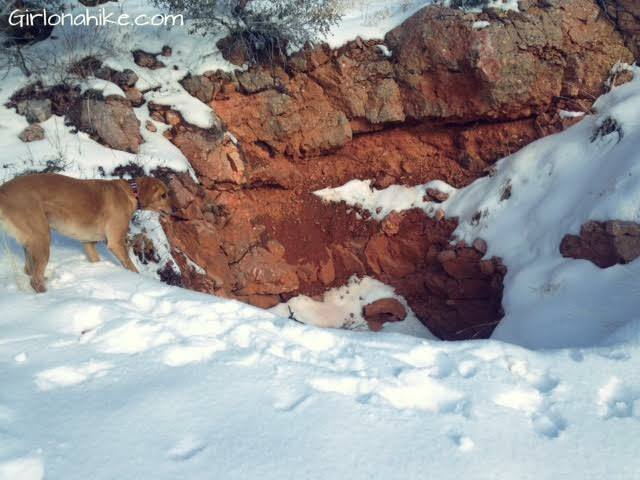 Charlie found an old mine pit! The ridge seemed to get steeper and steeper. 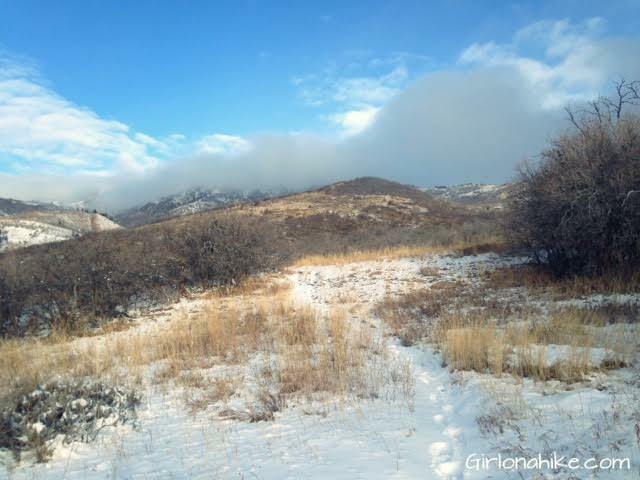 Because of the snow, we got off trail slightly, and had to do a little bushwhacking. My poles and microspikes really helped. To my right is my friend Janus, and to the left is Tor. 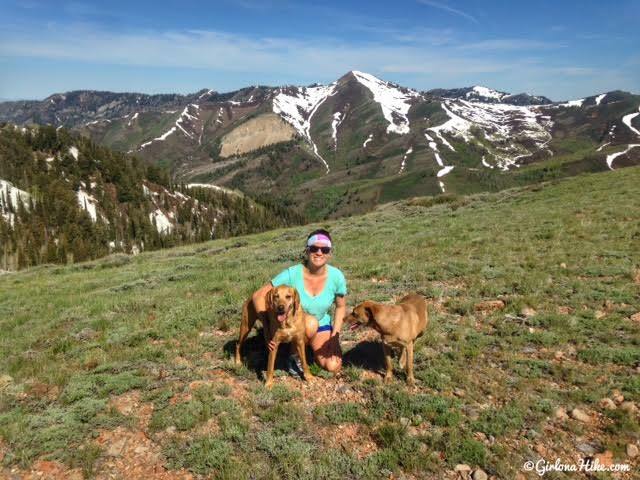 They are amazing hikers from the Wasatch Peak Baggers club on Facebook. 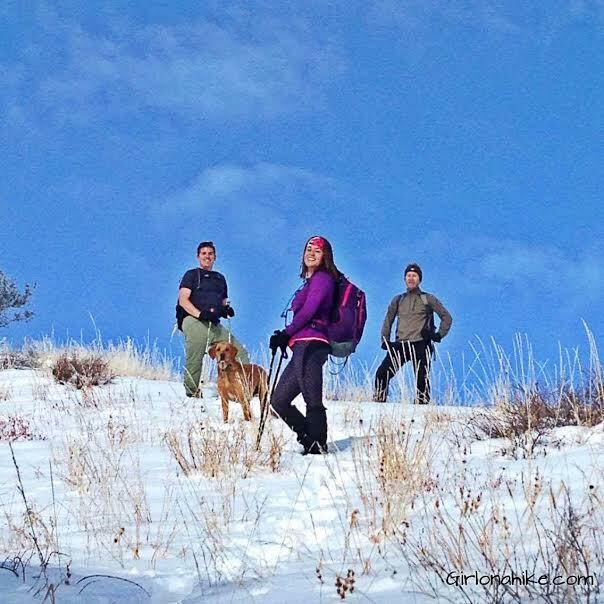 If you love hiking to peaks year-round this is the group for you! 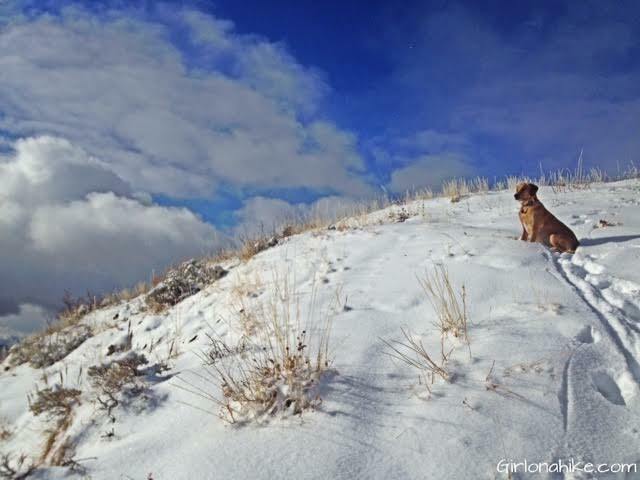 Charlie looks at his view from a false summit. This peak is sneaky, making you climb over 4-5 false summits. Just when you think you are there - it keeps going! 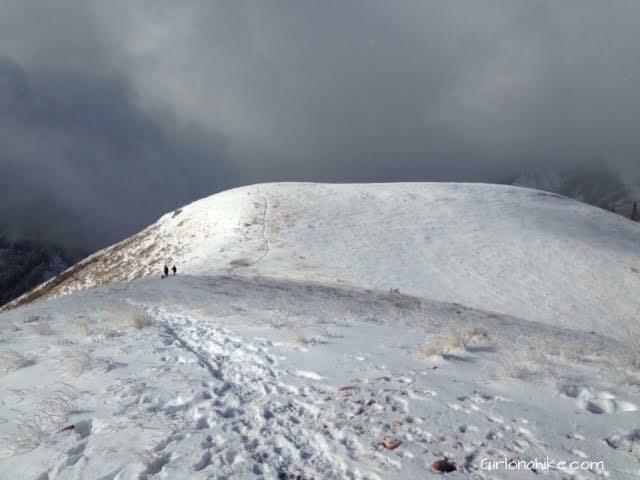 What made our hike even more challenging besides the elevation gain, was that we broke trail along the ridge in a foot of snow at times. This is looking back from where we've come so far. Snow clouds started to move in...sometimes a clear view of where you are going isn't always going to happen. You need to push through the clouds to see the light again. Finally, Lookout Peak is in view! I was surprised to see that this peak is basically a large, open meadow. 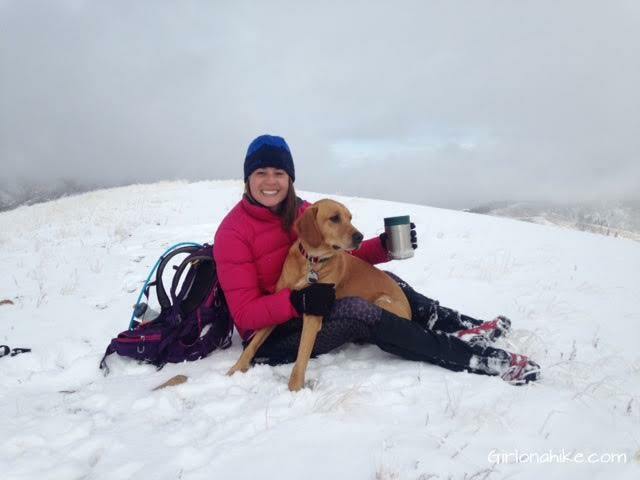 The best way to keep warm on a summit? A dog in your lap, and hot chocolate in your hands! I enjoyed hiking up to Lookout much more without snow. Made it much easier! 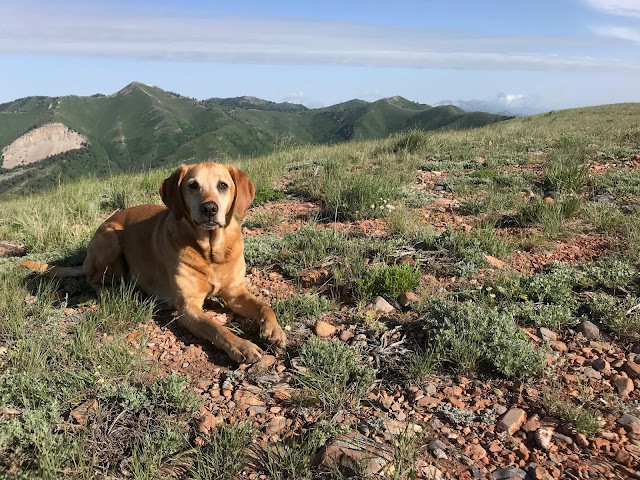 Charlie and his dad summited June 2018 - what a difference in snow levels (none!)! I did the beginning part of this hike from the same trailhead in the fall. I didnt realize this was where Lookout Peak was! It was also really new and they didnt have any of the signage up yet (except for poop fairy signs ha!) Will have to make it to the peak one day. 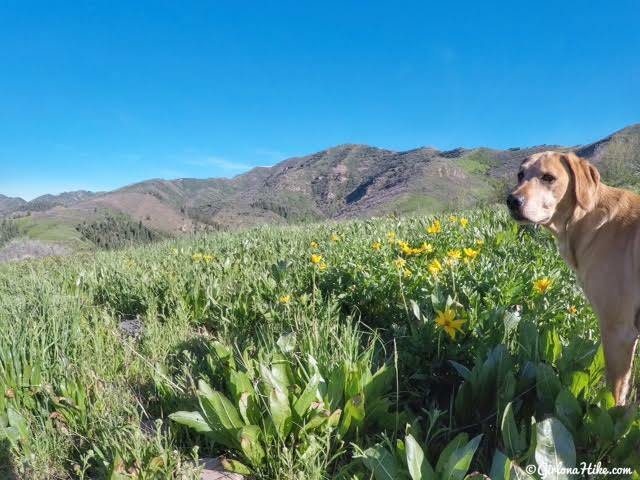 Looks like a great hike--Thanks for sharing! Yah, you gotta get back up there! I would wait until it's dry though. 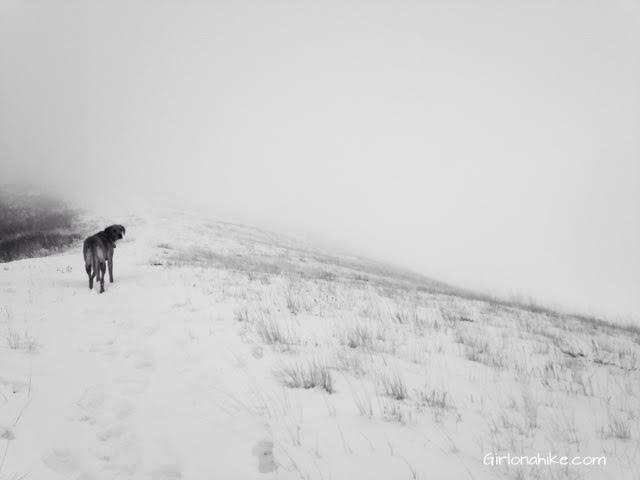 On our way down, most of the snow turned to thick mud! Yuck! 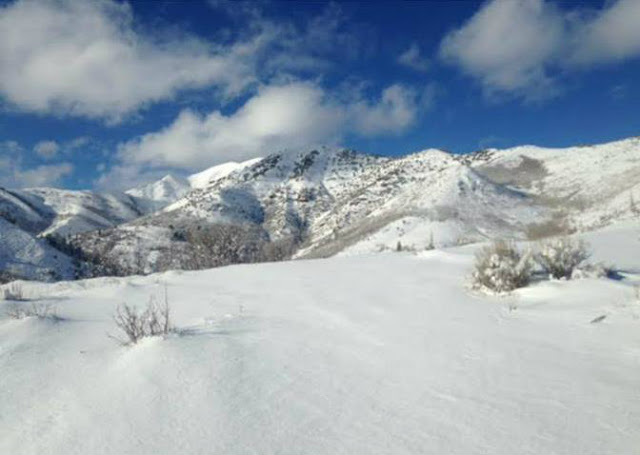 It would be easier to hike without all the snow, especially near the peak.